The high-speed ferry known as The Cat sits at the Ocean Gateway Terminal in Portland, June 6, 2016. 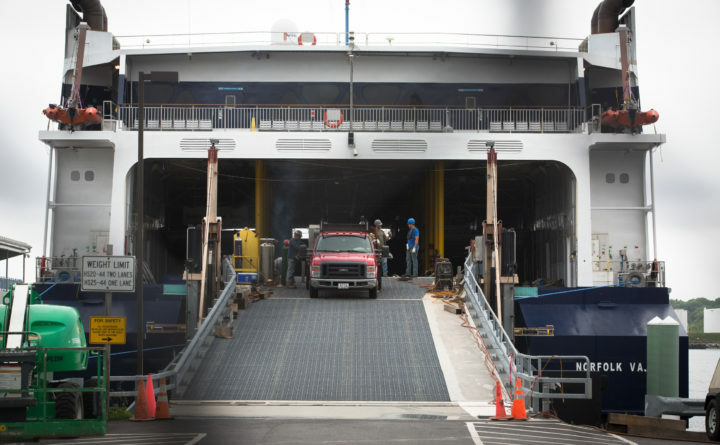 The Bar Harbor Town Council voted Tuesday to begin negotiations with Bay Ferries Ltd., which operates The Cat, to see whether to resume ferry service between the town and Yarmouth, Nova Scotia. BAR HARBOR, Maine — Despite some concerns raised by residents, the Town Council decided Tuesday to negotiate with Bay Ferries to see if they might reach an agreement by this fall to restore Canadian ferry service to the currently idle ferry terminal on Route 3. Bay Ferries, which since 2016 has operated the ferry from Portland to Yarmouth, Nova Scotia, has proposed to lease the Bar Harbor site for five years, beginning in 2019. The Canadian company has said it needs to reach an agreement by early October in order to relocate the Nova Scotia ferry service to Bar Harbor by next June. The council voted unanimously to negotiate to see if the town might reach an agreement with the company by Oct. 2. Mark MacDonald, the CEO of Bay Ferries, attended the Tuesday night council meeting to answer questions about the proposal. While some councilors expressed enthusiasm for the ferry to return to Bar Harbor, which served as the base of operations for ferry service to Nova Scotia from 1956 to 2009, some local residents said they had concerns about it. Some present at the meeting said they felt like the town was rushing into a decision on the proposal, which it received last week, and that there should be a more open process that allows residents to weigh in on other possibilities. “I don’t think we’re ready to make a decision at all,” Dennis Bracale said of the possible uses at the 4.5-acre site, which Bar Harbor voters just last month decided to purchase from the state. James O’Connell said he was concerned about the possibility of the cost of diesel fuel skyrocketing in coming years, which could make operation of the ferry financially untenable. Donna Karlson said the cost of renovating an existing building for use by U.S. Customs and Border Protection would be too high. Estimates for bringing the terminal Bay Ferries currently uses in Portland up to the agency’s standards are around $7 million, she noted. Portland has balked at footing the bill. MacDonald said that the company has financial backing from the Nova Scotian government, and though the company has does not yet have any cost estimates for whatever improvements U.S. customs officials may require at the site, the company will not ask the town to pay for them. He also said that by relocating from Portland to Bar Harbor, which is closer to Nova Scotia, the company hopes to mitigate the impact of any future fuel cost increases. “We want to work with the town to help the town achieve its aspirations for the property,” MacDonald said. Other uses being considered include using the lot for satellite parking and as a public marina. Matthew Hochman, vice chairman of the council, said he wants to protect local taxpayers from any unseen costs Bay Ferries might incur if it spends $3 million on fixing up the property, which the company has indicated it is willing to do. Otherwise, he added, he is enthusiastic about the ferry relocating to Bar Harbor and generating revenue for the town. The company has suggested it would pay the town a minimum of $200,000 in annual rent for five years, though it would be willing to pay more if the ferry reaches certain ridership levels. “I’m very excited about this,” Hochman said.